The Ptolemaic system of celestial motion, from Harmonia Macrocosmica, 1661. The history of science in classical antiquity encompasses both those inquiries into the workings of the universe aimed at such practical goals as establishing a reliable calendar or determining how to cure a variety of illnesses and those abstract investigations known as natural philosophy. The ancient peoples who are considered the first scientists may have thought of themselves as natural philosophers, as practitioners of a skilled profession (for example, physicians), or as followers of a religious tradition (for example, temple healers). The encyclopedic works of Aristotle, Archimedes, Hippocrates, Galen, Ptolemy, Euclid, and others spread throughout the world. These works and the important commentaries on them were the wellspring of science. The practical concerns of the ancient Greeks to establish a calendar is first exemplified by the Works and Days of the Greek poet Hesiod, who lived around 700 BC. The Works and Days incorporated a calendar, in which the farmer was to regulate seasonal activities by the seasonal appearances and disappearances of the stars, as well as by the phases of the Moon which were held to be propitious or ominous. Around 450 BC we begin to see compilations of the seasonal appearances and disappearances of the stars in texts known as parapegmata, which were used to regulate the civil calendars of the Greek city-states on the basis of astronomical observations. Medicine provides another example of practically oriented investigation of nature among the Ancient Greeks. It has been pointed out that Greek medicine was not the province of a single trained profession and there was no accepted method of qualification of licensing. Physicians in the Hippocratic tradition, temple healers associated with the cult of Asclepius, herb collectors, drug sellers, midwives, and gymnastic trainers all claimed to be qualified as healers in specific contexts and competed actively for patients. This rivalry among these competing traditions contributed to an active public debate about the causes and proper treatment of disease, and about the general methodological approaches of their rivals. In the Hippocratic text, On the Sacred Disease, which deals with the nature of epilepsy, the author attacks his rivals (temple healers) for their ignorance and for their love of gain. The author of this text seems modern and progressive when he insists that epilepsy has a natural cause, yet when he comes to explain what that cause is and what the proper treatment would be, his explanation is as short on specific evidence and his treatment as vague as that of his rivals. There were several acute observers of natural phenomena, especially Aristotle and Theophrastus, who wrote extensively on animals and plants. Theophrastus also produced the first systematic attempt to classify minerals and rocks, summarised in the Naturalis Historia of Pliny the Elder in 77 AD. Ancient Greece was very advanced in Science & Technology. Thay produced theories about how the world works. There was a Hellenistic Age in Greek, in this Time the Greek culture spread throughout Persia, North Africa & Egypt. 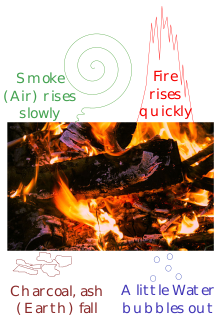 The four classical elements (fire, air, water, earth) of Empedocles illustrated with a burning log. The log releases all four elements as it is destroyed. The earliest Greek philosophers, known as the pre-Socratics, were materialists who provided alternative answers to the same question found in the myths of their neighbors: "How did the ordered cosmos in which we live come to be?" But although the question is much the same, their answers and their attitude towards the answers is markedly different. As reported by such later writers as Aristotle, their explanations tended to center on the material source of things. Thales of Miletus (624–546 BC) considered that all things came to be from and find their sustenance in water. Anaximander (610–546 BC) then suggested that things could not come from a specific substance like water, but rather from something he called the "boundless." Exactly what he meant is uncertain but it has been suggested that it was boundless in its quantity, so that creation would not fail; in its qualities, so that it would not be overpowered by its contrary; in time, as it has no beginning or end; and in space, as it encompasses all things. Anaximenes (585–525 BC) returned to a concrete material substance, air, which could be altered by rarefaction and condensation. He adduced common observations (the wine stealer) to demonstrate that air was a substance and a simple experiment (breathing on one's hand) to show that it could be altered by rarefaction and condensation. Heraclitus of Ephesus (about 535–475 BC), then maintained that change, rather than any substance was fundamental, although the element fire seemed to play a central role in this process. Finally, Empedocles of Acragas (490–430 BC), seems to have combined the views of his predecessors, asserting that there are four elements (Earth, Water, Air and Fire) which produce change by mixing and separating under the influence of two opposing "forces" that he called Love and Strife. All these theories imply that matter is a continuous substance. Two Greek philosophers, Leucippus (first half of the 5th century BC) and Democritus of Abdera (lived about 410 BC) came up with the notion that there were two real entities: atoms, which were small indivisible particles of matter, and the void, which was the empty space in which matter was located. Although all the explanations from Thales to Democritus involve matter, what is more important is the fact that these rival explanations suggest an ongoing process of debate in which alternate theories were put forth and criticized. Xenophanes of Colophon prefigured paleontology and geology as he thought that periodically the earth and sea mix and turn all to mud, citing several fossils of sea creatures that he had seen. The materialist explanations of the origins of the cosmos seems to miss an important point. It doesn't make much sense to think that an ordered universe comes out of a random collection of matter. How can a random assemblage of fire or water produce an ordered universe without the existence of some ordering principle? The first step in this emphasis upon a model was that of the followers of Pythagoras (approximately 582 – 507 BC), who saw number as the fundamental unchanging entity underlying all the structure of the universe. For Pythagoras and his followers matter was made up of ordered arrangements of point/atoms, arranged according to geometrical principles into triangles, squares, rectangles, and so on... Even on a larger scale, the parts of the universe were arranged on the principles of a musical scale and a number. For example, the Pythagoreans held that there were ten heavenly bodies because ten is a perfect number, the sum of 1 + 2 + 3 + 4. Thus with the Pythagoreans we find number emerging as the rational basis for an orderly universe — as the first proposal for a scientific ordering principle of the cosmos. Like the Pythagoreans, Plato (c. 427–c. 347 BC) found the ordering principle of the universe in mathematics, specifically in geometry. A later account has it that Plato had inscribed at the entrance to his school, the Academy, "Let no man ignorant of geometry enter." The story is a myth, but it has a grain of truth, for in his writings Plato repeatedly tells us of the importance of geometry. 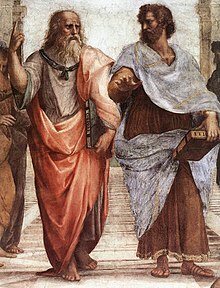 Plato is known more for his contributions to the philosophical basis of scientific method than to particular scientific concepts. He maintained that all things in the material world are imperfect reflections of eternal unchanging ideas, just as all mathematical diagrams are reflections of eternal unchanging mathematical truths. Since Plato believed that material things had an inferior kind of reality, he considered that we don't achieve demonstrative knowledge – that kind of knowledge we call science — by looking at the imperfect material world. Truth is to be found through rational demonstrations, analogous to the demonstrations of geometry. Applying this concept, Plato recommended that astronomy be studied in terms of geometrical models and proposed that the elements were particles constructed on a geometrical basis. Aristotle (384–322 BC) disagreed with his teacher, Plato, in several important respects. While Aristotle agreed that truth must be eternal and unchanging, he maintained that we come to know the truth through the external world which we perceive with our senses. For Aristotle, directly observable things are real; ideas (or as he called them, forms) only exist as they express themselves in matter, such as in living things, or in the mind of an observer or artisan. First, Aristotle emphasized observation of the material entities which embody the forms. Second, he played down the importance of mathematics. Third, he emphasized the process of change where Plato had emphasized eternal unchanging ideas. Fourth, he reduced the importance of Plato's ideas to one of four causal factors. the matter of which a thing was made (the material cause). the form into which it was made (the formal cause; something similar to Plato's ideas). the agent who made the thing (the moving or efficient cause). the purpose for which the thing was made (the final cause). Aristotle's emphasis upon causes fundamentally shaped the later development of science by insisting that scientific knowledge, what the Greeks called episteme and the Romans scientia, is knowledge of necessary causes. He and his followers would not accept mere description or prediction as science. In view of this disagreement with Plato, Aristotle established his own school, the Lyceum, which further developed and transmitted his approach to the investigation of nature. Most characteristic of Aristotle's causes is his final cause, the purpose for which a thing is made. He came to this insight through his biological researches, in which he noted that the organs of animals serve a particular function. The absence of chance and the serving of ends are found in the works of nature especially. And the end for the sake of which a thing has been constructed or has come to be belongs to what is beautiful. Thus Aristotle was one of the most prolific natural philosophers of Antiquity. He made countless observations of the structure and habits of animals, especially those in the sea at Lesbos. He also made many observations about the large-scale workings of the universe, which led to his development of a comprehensive theory of physics. For example, he developed a version of the classical theory of the elements (earth, water, fire, air, and aether). In his theory, the light elements (fire and air) have a natural tendency to move away from the center of the universe while the heavy elements (earth and water) have a natural tendency to move toward the center of the universe, thereby forming a spherical earth. Since the celestial bodies – that is, the planets and stars – were seen to move in circles, he concluded that they must be made of a fifth element, which he called Aether. Aristotle could point to the falling stone, rising flames, or pouring water to illustrate his theory. His laws of motion emphasized the common observation that friction was an omnipresent phenomenon – that any body in motion would, unless acted upon, come to rest. He also proposed that heavier objects fall faster, and that voids were impossible. Theophrastus noted that tourmaline attracts straws and bits of wood when heated. Aristotle's successor at the Lyceum was Theophrastus, who wrote valuable books describing plant and animal life. His works are regarded as the first to put botany and zoology on a systematic footing. He also produced one of the very first works on mineralogy, with descriptions of ores and minerals known to the world at that time. He made some shrewd observations of their properties. For example, he made the first known reference to the phenomenon, now known to be caused by pyroelectricity, that the mineral tourmaline attracts straws and bits of wood when heated. Pliny the Elder makes clear references to his use of the work in his Natural History of 77 AD, while updating and making much new information available on minerals himself. From both these early texts was to emerge the science of mineralogy, and ultimately geology. Both authors describe the sources of the minerals they discuss in the various mines exploited in their time, so their works should be regarded not just as early scientific texts, but also important for the history of engineering and the history of technology. Pliny is especially significant because he provides full bibliographic details of the earlier authors and their works he uses and consults. Because his encyclopedia survived the Dark Ages, we know of these lost works, even if the texts themselves have disappeared. The book was one of the first to be printed in 1489, and became a standard reference work for Renaissance scholars, as well as an inspiration for the development of a scientific and rational approach to the world. The important legacy of this period of Greek science included substantial advances in factual knowledge, especially in anatomy, zoology, botany, mineralogy and astronomy; an awareness of the importance of certain scientific problems, especially those related to the problem of change and its causes; and a recognition of the methodological importance of applying mathematics to natural phenomena and of undertaking empirical research. The military campaigns of Alexander the Great spread Greek thought to Egypt, Asia Minor, Persia, up to the Indus River. The resulting Hellenistic civilization produced seats of learning in Alexandria in Egypt and Antioch in Syria along with Greek speaking populations across several monarchies. Hellenistic science differed from Greek science in at least two ways: first, it benefited from the cross-fertilization of Greek ideas with those that had developed in the larger Hellenistic world; secondly, to some extent, it was supported by royal patrons in the kingdoms founded by Alexander's successors. Especially important to Hellenistic science was the city of Alexandria in Egypt, which became a major center of scientific research in the 3rd century BC. Two institutions established there during the reigns of Ptolemy I Soter (reigned 323–283 BC) and Ptolemy II Philadelphus (reigned 281–246 BC) were the Library and the Museum. Unlike Plato's Academy and Aristotle's Lyceum, these institutions were officially supported by the Ptolemies; although the extent of patronage could be precarious, depending on the policies of the current ruler. Hellenistic scholars frequently employed the principles developed in earlier Greek thought: the application of mathematics and deliberate empirical research, in their scientific investigations. The interpretation of Hellenistic science varies widely. At one extreme is the view of English classical scholar Cornford, who believed that "all the most important and original work was done in the three centuries from 600 to 300 BC". At the other end is the view of Italian physicist and mathematician Lucio Russo, who claims that the scientific method was actually born in the 3rd century BCE, only to be forgotten during the Roman period and not revived again until the Renaissance. 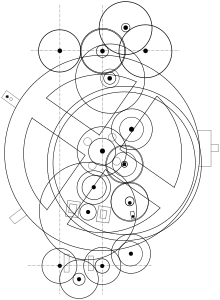 The level of Hellenistic achievement in astronomy and engineering is impressively shown by the Antikythera mechanism (150–100 BCE). It is a 37-gear mechanical computer which computed the motions of the Sun and Moon, including lunar and solar eclipses predicted on the basis of astronomical periods believed to have been learned from the Babylonians. Devices of this sort are not known to have been engineered again until the 10th century, when a simpler eight-geared luni-solar calculator incorporated into an astrolabe was described by Persian scholar Al-Biruni. [not in citation given] Similarly complex devices were also developed by other Muslim engineers and astronomers during the Middle Ages. In medicine, Herophilos (335–280 BCE) was the first to base his conclusions on dissection of the human body and to describe the nervous system. Geometers such as Archimedes (c. 287 – 212 BCE), Apollonius of Perga (c. 262 – c. 190 BCE), and Euclid (c. 325 – 265 BCE), whose Elements became the most important textbook in mathematics until the 19th century, built upon the work of the Hellenic era Pythagoreans. Eratosthenes used his knowledge of geometry to measure the distance between the Sun and the Earth along with the size of the Earth. Astronomers like Hipparchus (c. 190 – c. 120 BCE) built upon the measurements of the Babylonian astronomers before him, to measure the precession of the Earth. 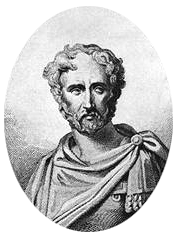 Pliny reports that Hipparchus produced the first systematic star catalog after he observed a new star (it is uncertain whether this was a nova or a comet) and wished to preserve astronomical record of the stars, so that other new stars could be discovered. It has recently been claimed that a celestial globe based on Hipparchus's star catalog sits atop the broad shoulders of a large 2nd-century Roman statue known as the Farnese Atlas. Science in the Roman Empire period was concerned with systematizing knowledge gained in the preceding Hellenistic period and the knowledge from the vast areas the Romans had conquered. It was largely their work that would be passed on to later civilizations. Even though science continued under the Roman Empire, Latin texts were mainly compilations drawing on earlier Greek work. Advanced scientific research and teaching continued to be carried on in Greek. Such Greek and Hellenistic works as survived were preserved and developed later in the Byzantine Empire and then in the Islamic world. Late Roman attempts to translate Greek writings into Latin had limited success, and direct knowledge of most ancient Greek texts only reached western Europe from the 12th century onwards. Pliny the Elder: an imaginative 19th-century portrait. A mosquito and a fly in a Baltic amber necklace. Of particular importance is the Naturalis Historia of Pliny the Elder published in 77 CE, one of the most extensive compilations of the natural world which survived the Dark Ages. Pliny does not simply list materials and objects but also seeks explanations of phenomena. Thus he is the first to correctly describe the origin of amber as being the fossilized resin of pine trees. He makes the inference from the observation of trapped insects within some amber samples. The Naturalis Historia divides neatly into the organic world of plants and animals, and the realm of inorganic matter, although there are frequent digressions in each section. He is especially interested in not just describing the occurrence of plants, animals and insects, but also their exploitation (or abuse) by man. The description of metals and minerals is particularly detailed, and valuable as being the most extensive compilation still available from the ancient world. Although much of the work was compiled by judicious use of written sources, Pliny gives an eye witness account of gold mining in Spain, where he was stationed as an officer. Ptolemy systematized the study of astronomy, drawing on the work of his predecessors to build astronomy upon a secure empirical basis and to demonstrate the relationship between astronomical observations and the resulting astronomical theory. His Almagest defined the method and subject matter of future astronomical research and the Ptolemaic system became the dominant model for the motions of the heavens. In like manner, the Roman-era physician Galen codified and somewhat built upon Hellenistic knowledge of anatomy and physiology. His careful dissections and observations of dogs, pigs, and Barbary apes, his descriptions (based on these and the works of earlier authors) of such structures as the nervous system, heart, and kidneys, and his demonstrations that, for instance, arteries carry blood instead of air became a central part of medical knowledge for well over a thousand years. ^ Lloyd (1970), p. 81; Thurston, p. 21. ^ Thurston, pp. 111–12; D. R. Lehoux, Parapegmata: or Astrology, Weather, and Calendars in the Ancient World, PhD Dissertation, University of Toronto, 2000, p. 61. ^ Lloyd (1979), pp. 38–9. ^ Lloyd (1979), pp. 15–24. ^ Lloyd (1970), pp. 16–21; Cornford, pp. 171–8. ^ Lloyd (1970), pp. 21–3. ^ Lloyd (1970), pp. 36–7. ^ Lloyd (1970), pp. 39–43. ^ Lloyd (1970), pp. 45–9. ^ Lloyd (1970), pp. 24–31. ^ A. M. Alioto, A History of Western Science, (Englewood Cliffs, NJ: Prentice–Hall, 1987), p. 44. ^ Lindberg, pp. 35–9; Lloyd (1970), pp. 71–2, 79. ^ Lindberg, pp. 47–68; Lloyd (1970), pp. 99–124. ^ Aristotle, De partibus animalium, 645a22–6; quoted in Lloyd (1968), p. 70. ^ Lloyd (1968), pp. 134–9, 162–70. ^ Lloyd (1970), pp. 144–6. ^ Lloyd (1973), pp. 1–7. ^ F. M. Cornford, The Unwritten Philosophy and Other Essays, p. 83, quoted in Lloyd (1973), p. 154. ^ Otto Neugebauer, A History of Ancient Mathematical Astronomy, (New York: Springer, 1975), pp. 284–5; Lloyd (1973), pp. 69–71. ^ Stahl, see esp. pp. 120–133. ^ Goldstein, Bernard R. (1997). "Saving the Phenomena: the Background to Ptolemy's Planetary Theory". Journal for the History of Astronomy. 28: 1–12. Bibcode:1997JHA....28....1G. Alioto, Anthony M. A History of Western Science. Englewood Cliffs, NJ: Prentice Hall, 1987. ISBN 0-13-392390-8. Clagett, Marshall. Greek Science in Antiquity. New York: Collier Books, 1955. Cornford, F. M. Principium Sapientiæ: The Origins of Greek Philosophical Thought. Cambridge: Cambridge Univ. Pr, 1952; Gloucester, Mass. : Peter Smith, 1971. Lindberg, David C. The Beginnings of Western Science: The European Scientific Tradition in Philosophical, Religious, and Institutional Context, 600 B.C. to A.D. 1450. Chicago: Univ. of Chicago Pr, 1992. ISBN 0-226-48231-6. Lloyd, G. E. R. Aristotle: The Growth and Structure of his Thought. Cambridge: Cambridge Univ. Pr, 1968. ISBN 0-521-09456-9. Lloyd, G. E. R. Early Greek Science: Thales to Aristotle. New York: W.W. Norton & Co, 1970. ISBN 0-393-00583-6. Lloyd, G. E. R. Greek Science after Aristotle. New York: W.W. Norton & Co, 1973. ISBN 0-393-00780-4. Lloyd, G. E. R. Magic Reason and Experience: Studies in the Origin and Development of Greek Science. Cambridge: Cambridge Univ. Pr, 1979. Pedersen, Olaf. Early Physics and Astronomy: A Historical Introduction. 2nd edition. Cambridge: Cambridge University Press, 1993. ISBN 0-521-40899-7. Stahl, William H. Roman Science: Origins, Development, and Influence to the Later Middle Ages. Madison: Univ. of Wisconsin Pr, 1962. Thurston, Hugh. Early Astronomy. New York: Springer, 1994. ISBN 0-387-94822-8. This page was last edited on 4 April 2019, at 16:56 (UTC).